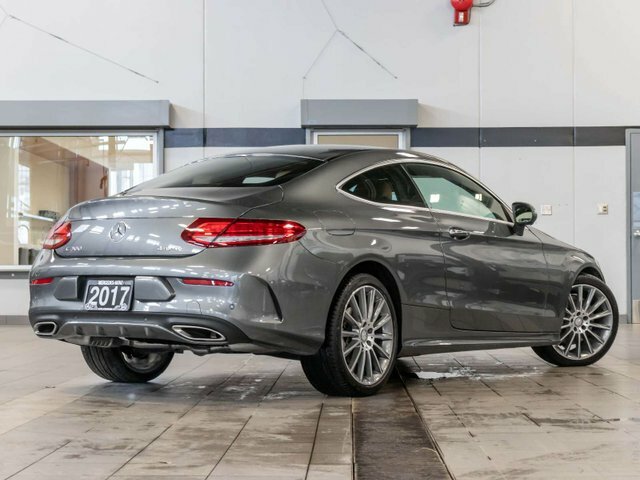 2017 C300 Coupe 4Matic with all-wheel drive and only 13,917kms. 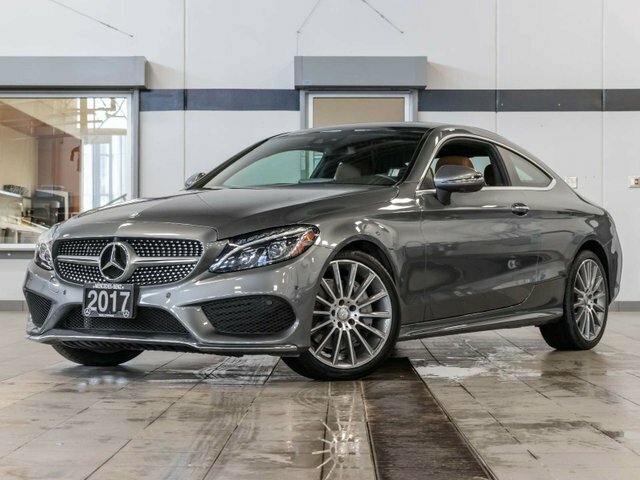 Originally purchased new from us at Kelowna Mercedes-Benz in June 2016 for an MSRP of $65,315 and recently traded back here to our dealership. Comes in a Selenite Grey Metallic exterior with upgraded Saddle Brown leather upholstery and Brown Ash Wood Open-Pore trim. Powering this C300 is a 2.0L Turbo I4 which produces 241hp and 273lb-ft of torque paired with a 7G-TRONIC automatic transmission. This vehicle has never been smoked in, and has never been in an accident with a clean CarProof history. A Star Certified Inspection was carried out, and during the process we noted the brakes to be in like new condition, and the tires having plenty of wear remaining. This vehicle was kept in immaculate condition, only driven locally and dealer serviced. Factory ordered options and packages include: Premium Package ($3,400) – COMAND Navigation, Rear View Camera and Static LED High Performance Headlamp System. Premium Plus Package ($3,000) – Sirius Satellite Radio, PARKTRONIC with Active Parking Assist, Hands-free Access, Ambient Lighting, EASY-PACK Power Trunk Closer, Keyless-Go, Illuminated Door Sill Panels and Integrated Garage Door Opener. 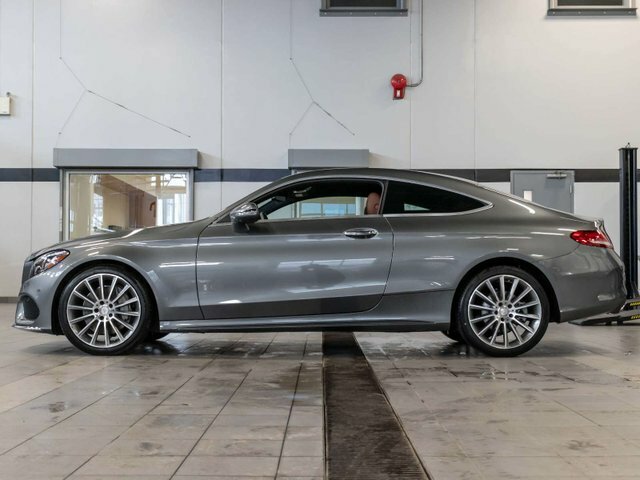 Sport Package ($1,500) – AMG Exterior and Interior Styling, Diamond Grille in Chrome and AMG Velour Floor Mats. Selenite Grey Metallic ($890). Saddle Brown Premium Leather ($1,990). 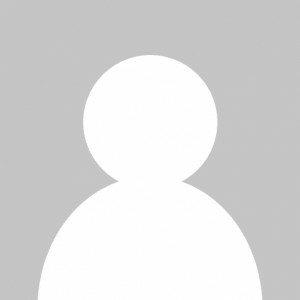 360 Degree Camera ($590). LED Intelligent Lighting System with Adaptive Highbeam Assist ($600). 19” AMG Multi-Spoke Alloy Wheels ($500). Surround Sound System ($1,000). Brown Ash Wood Trim ($250). Standard key features include – Blind Spot Monitoring, Collision Prevention Assist, Panoramic Sunroof, THERMATIC Automatic Climate Control, Heated Front Seats and Tire Pressure Loss Warning System. Comes with (2) sets of keys and all original owner's manuals. Mercedes-Benz Certified inspection with finance rates from 0.9% and still under factory warranty until June 2020 or 80,000kms. Pre-owned vehicle tax rate is determined by the purchasers home province residence. Contact the dealership for your personal video walk-around or any additional information.